If you'd like to own a home and get an idea of how much you can expect to pay with a 650 credit score, the data below offers a decent overview. So what would 650 credit score mortgage rates look like for a 30 year fixed loan of $100,000? Well, according to data from Informa Research Services, it’d be 4.89% in 2019. If, however, you chose a 15 year fixed loan on the same amount, the rate would drop to 4.304%. A little better, but it’s important to note that mortgage rates for a 650 credit score will be more expensive, understandably, than if you waited until your score improved. If your score fell to between 620 – 639, you could expect to pay $12,118 more in interest. However, if your score improved to 660 – 679, you’d save an $9,291. And if you waited until your score reached 680 – 699, you’d keep an extra $13,829. Once your score reached 700 – 759, you’d save an extra $17,538. Finally, once you attained the highest range being 760 – 850, you’d save $22,134. If your score fell to between 620 – 639, you could expect to pay $5,038 more in interest. However, if your score improved to 660 – 679, you’d save an $3,892. And if you waited until your score reached 680 – 699, you’d keep an extra $5,805. Once your score reached 700 – 759, you’d save an extra $7,374. Finally, once you attained the highest range being 760 – 850, you’d save $9,326. How low can your credit score be for mortgage approval? For many conventional loans, the lowest credit score you can have and still be approved is 620. The minimum for VA loan is also 620, however, some banks can allow consumers with 580 credit scores to be approved. The Federal Housing Administration allows for at least a 580 credit score with a 3.5% down payment. Yet, if your score is between 500 – 579, you can still be approved. You’ll just have to put down 10%. Related: Find out what 650 credit score auto interest rates look like here! 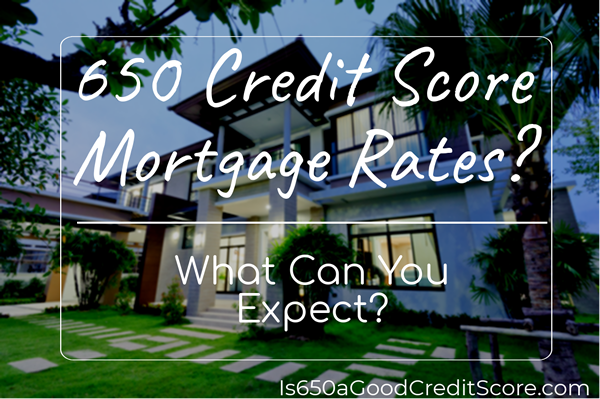 Are 650 credit score mortgage rates reasonable? Lenders will most likely be inclined to grant you a mortgage if your credit score reads 650. However, most of them will consider you a risky gamble, so the interest rates will be higher than if you had good credit as you can tell from the data above. You should consider improving your score first before applying for a mortgage with a 650 credit score. However, if you decide to move forward in acquiring the best 650 credit score mortgage rates, it’s a good idea to shop around through various lenders. This way you can choose the lowest rate in your area. Otherwise, waiting until you’ve increase your credit rating is not a bad idea. Save $50 off Credit Repair Service – Applies to first-work fee for each spouse sign-up. Make a habit of paying your balances when they are due. The longer you delay, the lower your credit score will be. Even if you make your payments a few days earlier than you used to, it will still make a positive difference in your credit score. There’s little you can do regarding the length of your credit card history. Generally, the longer you’ve held that card, the better your scores will be. But if you have more than one card, sometimes the length of time you’ve used other cards can factor into your credit score. An older account can help boost your scores significantly. The amount you owe other creditors also factors into your credit score. This does not necessarily mean that if you owe a lot of money your credit scores will plummet; it simply means you’ve nearly maxed out all your credit, it will affect your scores negatively. Is a 650 credit score mortgage rate worth it? If you have a 650 credit score, you’ll more often than not qualify for a mortgage. The downside is that you may end up paying hefty sums of money in the name of interest. Again, It’d be best if you first worked on improving your scores before taking out the loan. Or better still; seek the counsel of a credit counselor on what your best course of action would be. That way you will make the best decision.